We put in our tiny stawberry patch yesterday! This series of pics shows the details of how it was done. We dug down to the hardpack (remember, we’re on an ancient lakebed!) and lined it with black weedstop plastic. After placing the three tires, a small coffee can size hole was cut in the plastic under each tire for drainage and rooting. 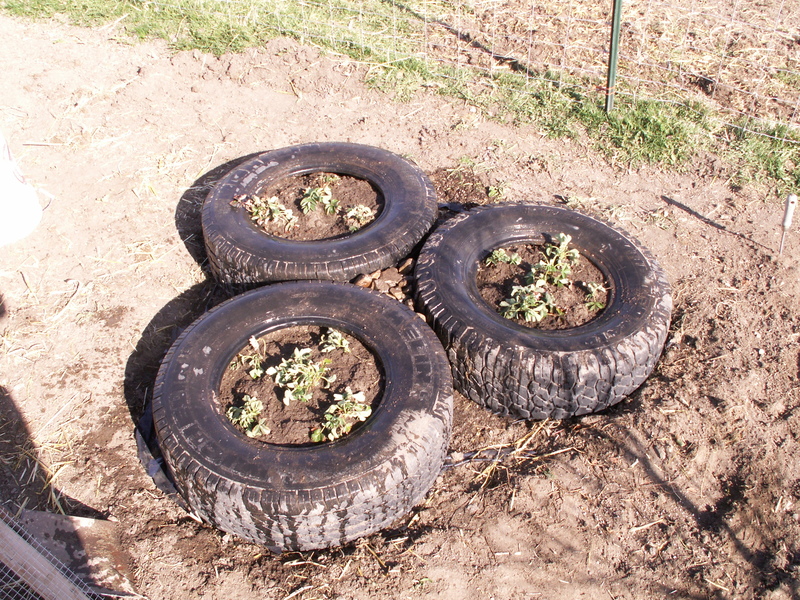 Then each tire was refilled with dirt BUT it was sifted in to remove weed roots. Our quack grass here is amazingly prolific! 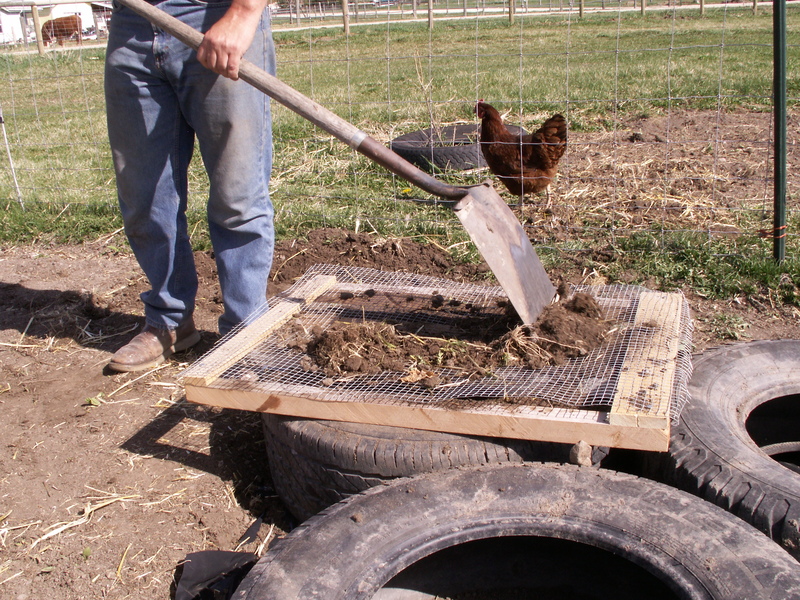 The sifter is made from 2×2 wood and 1/2″ hardware cloth. A couple shovel fulls is dumped on and then worked back and forth over the the sifter with a straight shovel to break up the dirt and fill the tires. 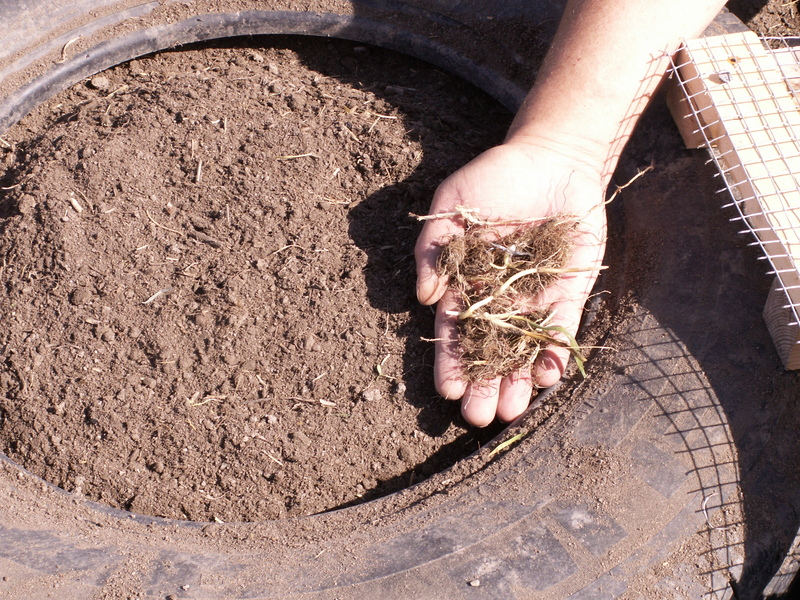 What you see is just a tiny handful of what the sifter saves us from having to deal with later by constant digging and weeding, with disturbs the dirt and can inhibit the plants growth. In just 3 tires, we pulled out enough roots to fill about 2 five gallon buckets!!! That’s water for the transplants, not sweat! Although, that’s probably about how much the sweat amounted to doing things this way…but, it’s all worth it. We now have weed free strawberry planters. 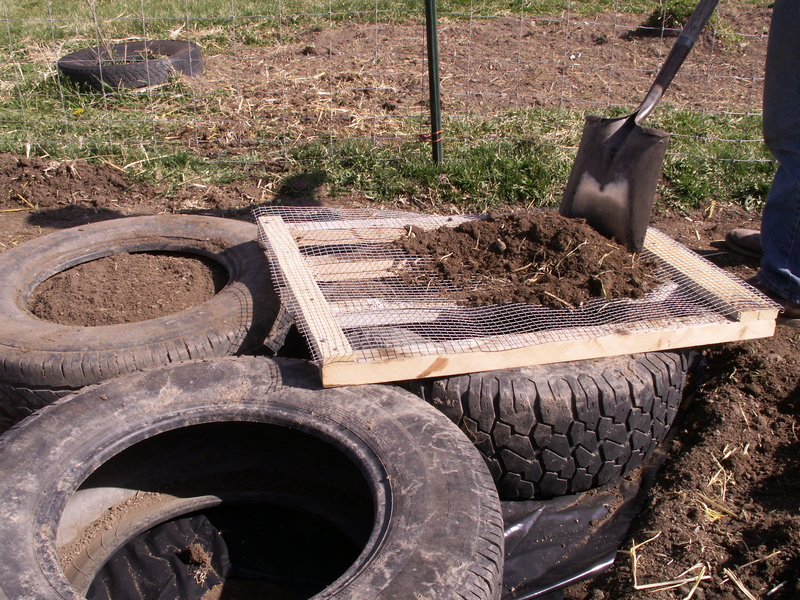 The dirt is aerated and the tires will help keep the root pack warm. This also helps contain the runners. The whole idea of putting it together this way is to save the need for lots of maintenance later. We don’t have to mess with the bio-processes below the surface by weeding, mulching, or thinning! A couple hours of labor in exchange for actually enjoying the strawberries without further sweat is well worth it! What a perfect project for Earth Day 2012! A pair of 40-something, disabled Veterans in the mountains of Montana. This is our kinda-sorta journal of experience about building up and running a micro farm towards the ideal of being self sustaining.